If I am EVER going to be a REAL astronut, I need to make sure my SpacePod is in GOOD working order. 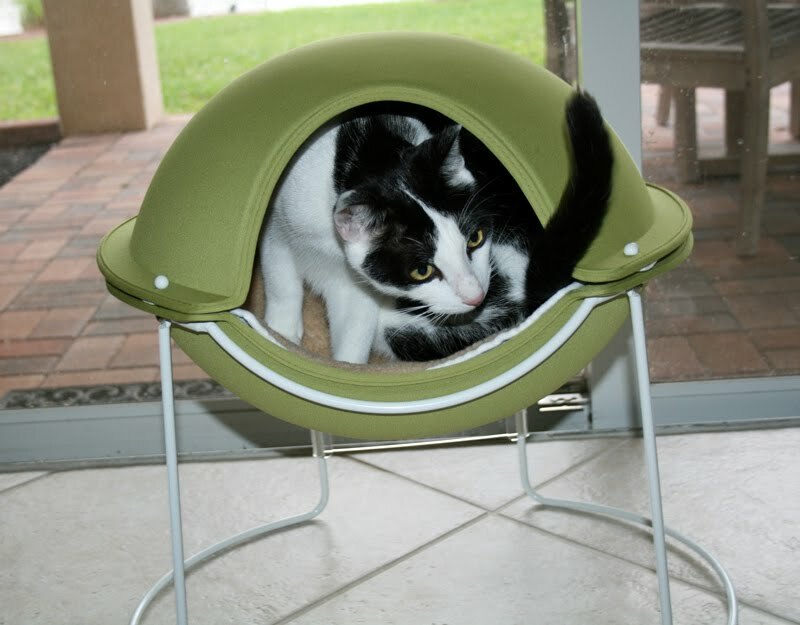 Since I am a BIG Mancat, it will be a TIGHT squeeze in here. I can FIT, except for my size EXTRA-LONG tail! My TAIL has a MIND of its OWN! AAAIIIEEEEE! We have ALREADY encountered some ALIEN life FORM! I can SENSE you do NOT come in PEACE! HAY! I SAW the COOKBOOK you brought: TO SERVE HARLEY! Harley, please go easy on Daisy today. She had to be in JAIL and is probably still crabbilated by it. How expert astronut you are!I love your space chair nut, it's fashion in green! You could take some pictures from the Aliens friends to publish here! Cool! Love your pictures, you are adorable. Harley, I think that's Daisy trick ! Did you end up chasing the alien? We have the same problems with our tails not fitting where we want them to. You will make a purrfect AstroNut Harley. Don't let the alien get you, Harley! WE love your Space Pod Harley. When do you leave?? Maybe Daisy will have a little peace. Get that tail tucked in so it doesn't blow off on take off. Hope all of you have a really fun day. Is the tail a little propeller on takeoff?? Harley, those space capsules like the Soyuz are pretty cramped so this is very good practice for you. to serve harley... hee hee. Here I come to save the day!!!!!!! you would be a pawsome astronaut! Harley, you are one handsome "cow kitty".....have you joined Andy's Cow Kitty Club?????? You can find the details on how to join on one of the tabs on our blog. Happy Thursday to all at your house. As long as she doesn't cook YOU Harley!! P.S. We love your space shuttle! Harley, we know your sister is a bit uppity, but you don't need to call her an alien! That pod is cooler than my box. But it do not has no door! I thinked you might need a door. 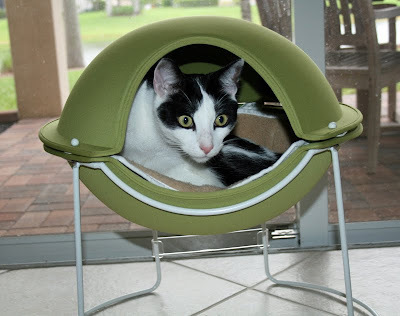 Or maybe you do not but Daisy does to keep YOU out when she wanted to be in the pod. We noticed the Alien encouraged your tail to enter the space pod! Wow! You have a cool spaceship. I want my own! I wonder how many people will get that last reference? And it not from Soylent Green! 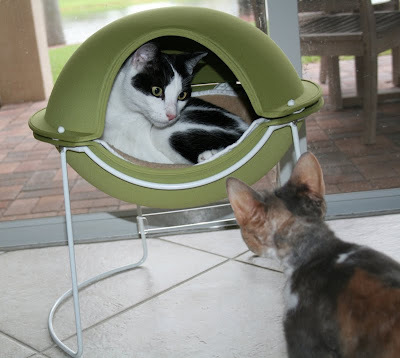 Since Daisy had to go to pee jail, the least you can do is let her have the space pod for a while, Harley. You are too silly, Harley! Tamir says his tail does the same thing!! We like your space pod Harley! You have one cool spaceship. What planet are you on? 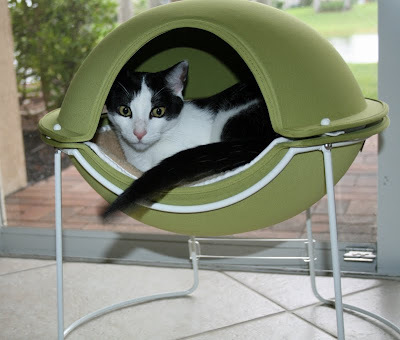 Great space pod Harley you look very astronautley in it! We saw that old Twilight Zone episode and if that ALF has a cookbook with To Serve Harley on the cover you must take every precaution! Harley, you are going to make a great astronaut for sure! I always have fun coming here!! 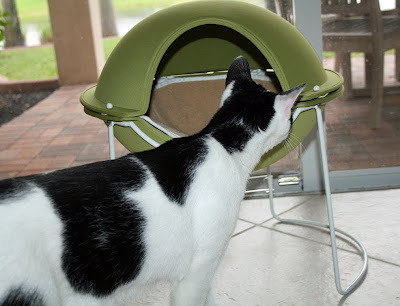 Harley, you are the first cowcat in space or The Twilight Zone! That's no ordinary alien, Harley. It's a GIRL-Alien. So you better watch out for her super-alien-girl-powers. 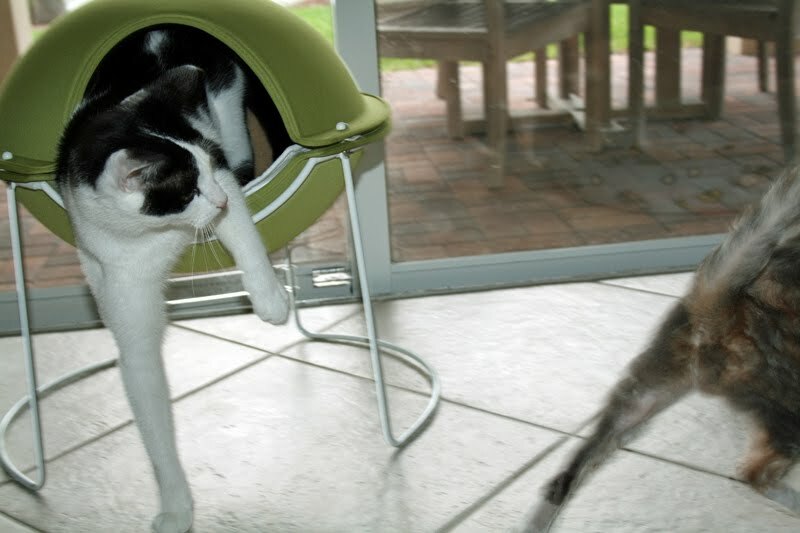 We note that yer tail fitted the capsule! So go for the flight!. What a cool SpacePod you have ! Did you catch the Alien ?? Nice retro "space pod". We're always on the lookout for modernist design for cats. wow, that SpacePod is AWESOME! bet Iggy and Fae would want one! but seriously, what alien would want to eat you, Harley? you're much too mancatly and cute!